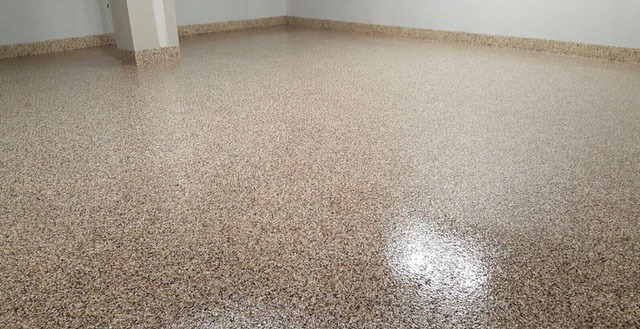 SANSEAM® Epoxy Vinyl Flake Flooring is a two-component, decorative, 100% solids epoxy formulated with vinyl flakes that can be applied over tile, concrete, wood any many other surfaces to a thickness of 1/16"-1/4" . 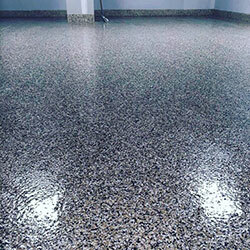 The final sealer/top coat can be either an epoxy or polyurethane with a smooth or non-skid texture. SANSEAM® can be used wherever the existing floor is in a worn and deteriorated condition or where a decorative floor surface is required in offices, cafeterias, garages, washrooms, laboratories, and other plant or institutional locations. SANSEAM® EPOXY Vinyl Flakes are available in a variety of colors and under our "color chart" tab a list of common blends are shown. The colors can be custom designed, mixed, and blended to provide hundreds of color variations. © 2017 Industrial Floor Corporation. All rights reserved. Serving PA, NJ, NY, DE, VA, DC, MD as well as Nationwide since 1932.